Working on bikes since 1987, Jimmy’z Mobile Bike Repair was started as a side project in 2008. Multiple friends started buying more bicycle things on-line but didn’t know what to do from there. They needed someone knowledgeable and trustworthy and that’s where I come in! Road bikes, kids bikes, mountain bikes, beach cruisers, cyclocross, BMX, triathlon and E-bikes. 32 years of experience means I specialize in almost everything! A full service, mobile bike shop that comes to you at work, home, or the races and services 99% of repairs on the spot. It can’t get anymore convenient than that! I have been relying on Jimmy for bicycle repair for several years. For routine maintenance, he can even work on your bike at your house/trailer park/campsite. How easy is that? Besides the convenience factor, the main reason I would recommend Jimmy is the care and attention he has consistently shown over the years when servicing my bikes. No more waiting on my LBS to take several days to accommodate my needs, and with no guarantee the service/equipment install was done correctly. 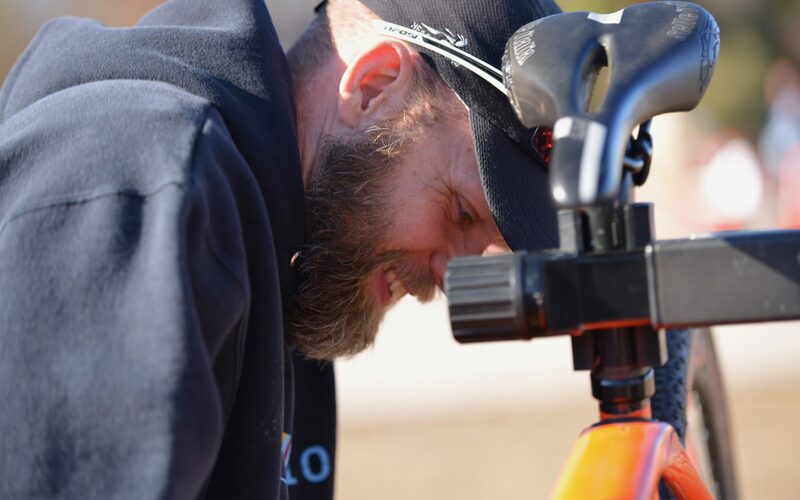 Jimmy’s work is impeccable, and the peace of mind that comes with knowing that my bike is ready for most anything I can do to it is invaluable. Jimmy did an amazing custom build for me of a Cervelo S3 with Campagnolo Super Record EPS. Because of the aero seat tube, the battery would not fit. He managed to fit the battery in the down tube, mate it to the water bottle bolts, and custom drilled a hole for the charging port. Looks like it came from the factory that way. Great job, Jimmy! Overall bike clean, all braking adjustments, all shifting adjustments, drivetrain lubrication and chain wear check, all bearing points checked and adjusted, both wheels trued as needed, full safety bike check. Best for routine maintenance on bikes with moderate ride time or have been in storage collecting dust. Everything included from Tune Up plus bottom bracket overhaul. Great for bikes that might be getting a little muddy like cyclocross and mountain bikes. Everything included from Major Tune Up plus a complete drivetrain overhaul. All drivetrain parts (chain, chainrings, cassette, derailleurs) removed and cleaned. Best for routine maintenance on bikes with moderate to long extended ride time. Complete bike breakdown, everything removed from frame and deep cleaned and reassembled. No extra charges for part installation so it’s a perfect time to replace tires, cables, chain, bartape etc. Bike is completely restored to like new condition. Best as yearly maintenance for bikes with lots of hours and miles ridden during the season. Jimmy will come to you.